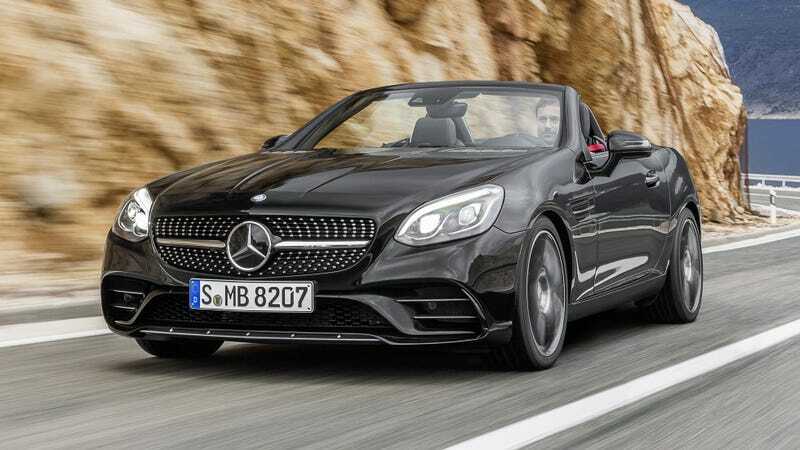 The Mercedes-Benz SLC nameplate, originally on a hardtop coupe from the ‘80s, is returning to the lineup in 2017—killing off the SLK-Class with its introduction. It’s not to be mistaken with the company’s other recent reveal of the SL coupe and roadster, even though they could be totally mistaken. The three main clues to differentiate the new SL-Class from the SLC-Class, besides the SL being the bigger one, are easy to spot: the SLC basically has the SL’s grille, but upside-down, as well as only one fake front-fender air vent accent line compared to the SL’s two fake front-fender air vent accent lines. The final clue is the biggest difference, with the SLC sporting taillights that don’t resemble drunken paint-strokes, like with the questionable SL design. Other than that, both are sleek styled hard-top convertibles. The new SLC 300 model (which is essentially an SLK refresh) will carry-on with the current SLK’s 2.0 liter turbocharged four-cylinder, good for 241 hp and 273 lb-ft of torque according to Automotive News. The new Mercedes-AMG SLC 43 will get a 3.0 liter bi-turbo V6 with 362 hp and 384 lb-ft or torque. Both models come standard with a 9G-Tronic transmission. In my eyes, the SL isn’t a big enough departure to beat it’s little sibling, with the SLC being more affordable (likely somewhere in the high $40,000 range starting) and better styled. But hey, if you’ve got money, spend money, amirite? We’ll get gas mileage and a whole bunch of other information at the Detroit Auto Show in January. Also, SLC makes a lot more sense for a compact coupe than SLK. Thanks Mercedes.